Cut for a loose fit, the fabric drapes softly away from the body while maintaining a flattering feminine shape. 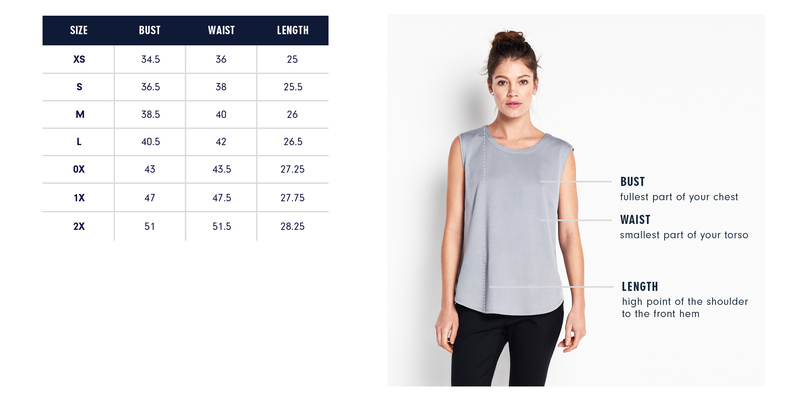 Our model in topaz, is 5’9 ½” and wearing a size S. Our model in white and black is 5’8.5” and wearing a size S. Runs slightly large; if you are in-between sizes, we recommend sizing down. Armhole re-shaped for maximum comfort and coverage. Bust dart adjusted to best fit a fuller chest. Curve of hem reshaped so that it can easily be worn untucked or tucked-in. Our model is 5’11 ½” and wearing a 1X. For more details about the fit of our extended sizes, please see our page About Extended Sizing.